Chris Brown Has Blocked Chrissy Teigen on Twitter. Congrats, Chrissy! 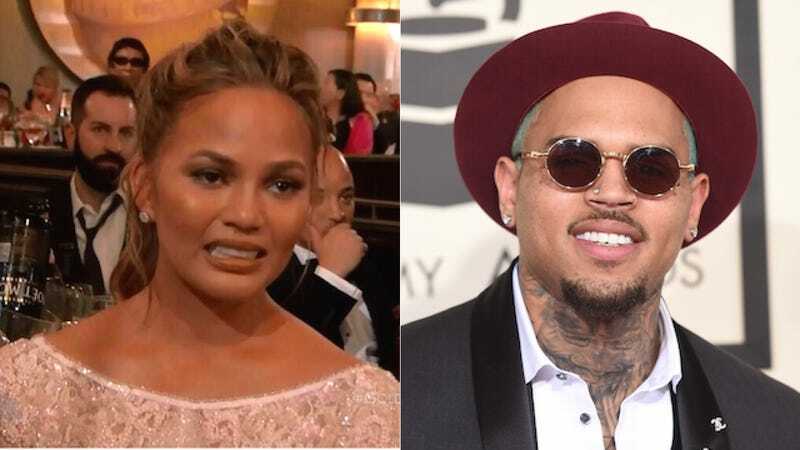 Back in 2012, Chrissy Teigen and Chris Brown were not on great terms after Teigen sarcastically tweeted that she was excited to see Brown perform at the Billboard Awards because she loves "loud and surprising background fits of rage I can hear from the audience!" Jump forward to 2015 and the relationship, you'll find, has not much improved. Teigen recently went to Chris Brown's Twitter page to, I don't know, read his mentions? Favorite some old tweets? Pick up some tips on overabundant hashtag use? What she found instead was that she had been blocked. Controversial opinion, but I say this shows real growth for Brown. Rather than engage with Teigen and get angry, he's shutting her out and pretending like she doesn't exist. Unfortunately, considering that Teigen spent all last night fielding attacks from Chris Brown fans, I can't say the same for Team Breezy. Duggar family add-on Derrick Dillard has received a barrage of criticism since attempting—on video—to crash into a cat while sledding at the Duggar compound and now even PETA is getting involved. Derrick should "remind his followers that Jesus' command to 'do unto others' includes all of God's creatures," the organization stated. Photos via Getty, AP, Instagram.